Some of my friends share with me some very unusual and sometimes unbelievable emails. Today was no different. I received an email that was sent to me as a joke however I remember so many of the events as being true, I can’t keep up with all of the scandals contained in the email content below! Can you spot any event that is truly a joke? And she’ll still have people vote for her after knowing all this ! Share with anyone that wants to hear the hilarious truth! Let me know which ones you think are jokes ok! I really would like to know. P.S. And what was definitely not a joke today was President Obama’s lengthy diatribe on “gun control” following the massacre in the small college in rural Oregon. Bill O’Reilly dissected President Obama’s totally incorrect conclusions and his network tv statements today…and O’Reilly pointed directly to Obama’s own state of Illinois where Obama never even acknowledges that Chicago exists…in the same community that he was a community organizer where he knows exactly what is happening there…and that he never acknowledges the massive slaughters that occur in the City of Chicago…where gun laws are some of the most rigid in our country…however are not enforced. Why Mr. President? You are trying to deny me and all Americans the right to protect ourselves and to me you protect Iranians and ISIS much more than you protect Americans. When will you get your facts and your thought processes as a President of the United States correct as they should be? When will our Senate and Congress stand up and do their jobs? Author dannorris42Posted on November 20, 2017 Categories PoliticalTags donald trump, hillary, jokes?, obama, which are jokes?Leave a comment on Is this email really a joke? Who can keep score anymore? As you know, my dear people, the last year for me has been an annus horribilus. 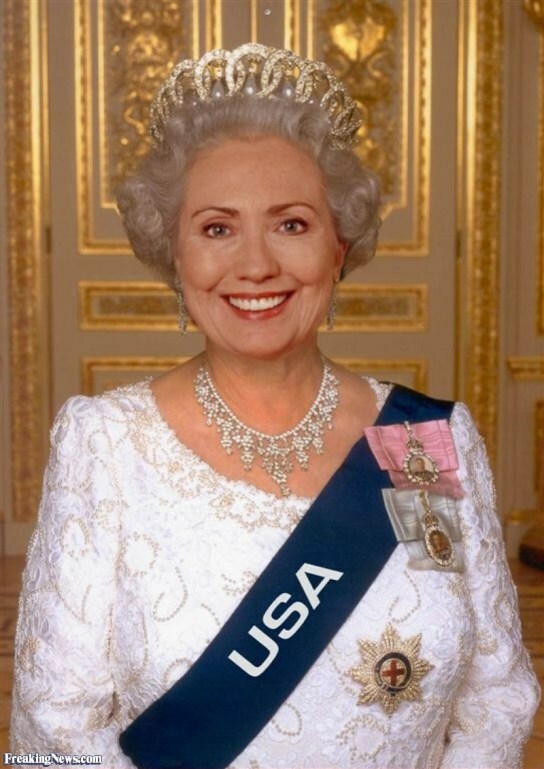 The Royal House of Clinton has been tormented by questions about our handling of finances and subjected to tiresome questions about the tragic events in Benghazi–in the furthest regions of our empire. And, sadly, also questions about my Royal e-mails. During those difficult times we had to cut back when our daughter was married. We only had three million dollars to spend on her wedding and I remember our hopes as she moved into her $10 million Manhattan apartment that one day she would be able to move on from that humble abode to something more fitting. So as I travel across our land to meet you all, I will be listening and sharing with you. Then when the time for the royal election comes I know you will crown me as your rightful monarch so that we can all live happily ever after. Say NO to Hillary Clinton in 2016! This is a documentary published by an unknown source. The content of this video has not been confirmed for accuracy of content. It is intended to provide the viewer with provocative opinions and perceptions that enlighten the thinking viewer. Author dannorris42Posted on November 18, 2017 Categories PoliticalTags arrogant political power, at work, bill clinton, her-majesty-the-queen, hillary, Hillary-Exposed, men-who-run-governmentLeave a comment on Political Power At Work! An academic look into the driving forces behind American Federal policymaking concludes that the average citizen in the United States has “essentially zero” influence over the direction of government. What Is Your Opinion? Do You Believe That We Must Stop These Threats To Our Country? Our President and Staff Ignore The Threats and Tell Us Lies About What Is Really Happening To Threaten Our Country. I happen to agree with the comments below wholeheartedly and as a citizen who loves this country…I will not take a Liberal, Progressive, Political attitude to vote the Democratic Party or their Candidates to further this agenda that will destroy our country….how about you? I am serious…are you? What do you believe? Do you consider that these comments should be ignored or should you contact your Congressman and Senators…and our President! Who should you vote into office to protect you? The answer is no, you have not. Just ask yourself…. WHY ??? Barack Obama, during his Cairo speech, said: “I know, too, that Islam has always been a part of America’s history.”…. Finally, Mr. Obama, where were the Muslims on Sept. 11th, 2001? If they weren’t flying planes into the World Trade Center, the Pentagon or a field in Pennsylvania killing nearly 3,000 people on our own soil, they were rejoicing in the Middle East . No one can dispute the pictures shown from all parts of the Muslim world celebrating on CNN, Fox News, MSNBC and other cable news network’s that day. Strangely, the very “moderate” Muslims who’s asses you bent over backwards to kiss in Cairo, Egypt on June 4th were stone cold silent post 9-11. To many Americans, their silence has meant approval for the acts of that day. And you and the Attorney General Eric Holder insist upon calling these many terrorist killings “workplace violence”. Author dannorris42Posted on November 15, 2017 Categories PoliticalTags get the truth on benghazi, hillary, Terrorists Threats, trey gowdy, U.S. CitizenLeave a comment on Who Will Get The Truth On Benghazi?